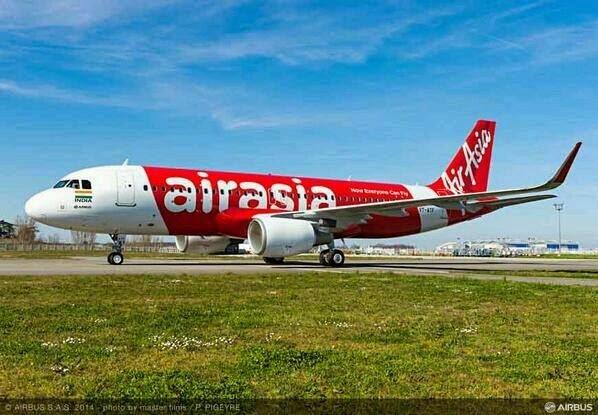 Chennai - Inching closer to the formal launch of its India operations, the first aircraft for the Indian subsidiary of Malaysia-based low-cost airliner AirAsia landed in Chennai today. AirAsia India, the subsidiary of AirAsia Group, received the first aircraft today at Chennai airport, a company statement said. The Airbus A320 landed at 9.25 am from its factory at Toulouse, France. The plane was greeted with a water cannon salute as it taxied on the runway, it said. The aircraft is configured in an all-economy layout with 180 seats. Currently, AirAsia India is awaiting AOP (air operator's permit) to start flying commercially, it said. "AirAsia India family takes immense pride in welcoming home its first aircraft which has just rolled of the manufacturing line from Toulouse", AirAsia India, Chief Executive Officer, Mittu Chandilya said. "The arrival of our first A320 signifies that we are a step closer to our dream to create a new benchmark in the low-cost air travel category", he said. AirAsia India's fleet will be drawn from the A320 family aircraft ordered by the AirAsia Group. To date, almost a third of the aircraft on order have already been delivered and are flying on AirAsia Group's operations out of Kuala Lumpur, Bangkok, Jakarta, Manila and now Chennai, it said. AirAsia India is a joint venture between AirAsia Group, Tata Sons Limited and Telestra Tradeplace.